As most of you surely experience at one time or another, presenting a comprehensive treatment plan that fully resolve a patient's malocclusion issues can produce financial sticker shock. Many, if not most, patients simply don't have the financial means to pay a large upfront fee. Fortunately, most dentists have developed treatment strategies to stage treatments over a period of time to reduce the financial burden, while still achieving treatment goals and increased case acceptance. What's more, there are times when you may want to boost your patient's confidence in your artistry and skill by showing them before and after pictures of cases you have delivered successfully in the past. In both scenarios, the BiteFX sequence feature is an ideal way to present the information to your patient in a highly organized and streamlined fashion. Here's how to create a sequence you can use over and over again to explain these topics to your patients. Create a folder on a location you prefer and give it a suitable folder name (e.g. Restoration Case 1). We recommend that you create folders that will be imported into BiteFX a shared network drive location that is accessible by all BiteFX workstations (and is required if you want to use the Information Sharing feature). Copy the image(s) you want to share with your patients into the folder. Remember, even if you are importing only one image, it must be put in a folder to be able to import it into BiteFX. 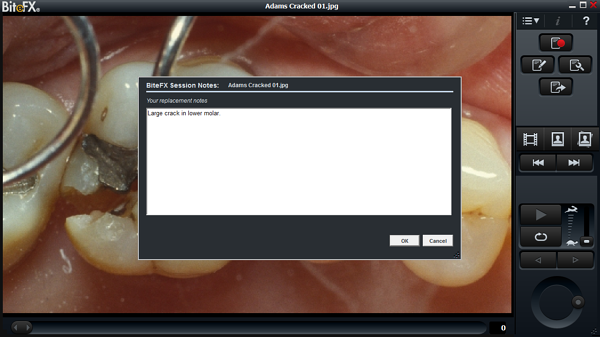 You may want to create multiple folders that you can import as needed to (a) show before and after pictures of previous cases to give your patient confidence in your artistry and skill, and (b) use pictures to explain how treatment steps can be spread out over time while meeting short term goals of stabilizing the bite and stopping further damage to the dentition. Import the folder into BiteFX on any workstation on which the application is installed. Click on the following link, How to Import Images Into BiteFX for Windows if you don't know how to do this. Open the Picture panel and scroll down to your imported images (imported images are always placed below the albums provided by the BiteFX software). Select "Edit Session Notes" from the menu list (or hit Ctrl+N on your keyboard) and a "BiteFX Session Notes" window will appear. Type in the notes you wish to associate with that image. 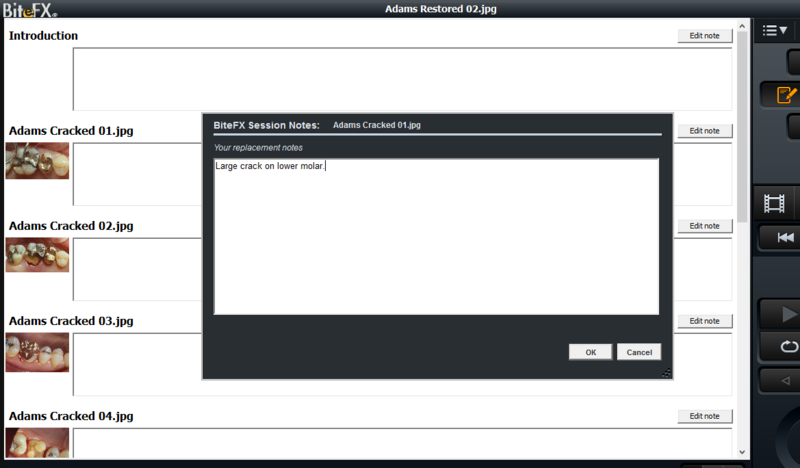 A new blank "BiteFX Session Notes" window will appear for you to enter the new text. Follow steps 4 & 5 until you have added notes for all of the images in your imported folder. When finished, click on "OK" at the bottom right corner of the window to close the editing window. After importing your Case Example folder into BiteFX, create a Custom Sequence using all of the images. Click on the following link, How to Create A Custom Sequence in BiteFX to learn how to create a custom sequence. Click on the first image thumbnail in your Case Example sequence to select it in the main screen. Start a recording by clicking on the "Start/stop session recording" (or hit Alt+S on your keyboard) button. Type in a session name and then click on "OK". Click on the "Next in sequence" button to cycle through each image in the sequence. To open the "BiteFX Session Notes" window for the first image, click on the "Edit note" button at the far right side on the line as the image file name, or easier still, just left click inside the box to the right of the thumbnail image. Type in your notes and then click on "OK" at the lower right corner of that window. Repeat steps 7-8 for each additional image until you have added notes for all of the imagesyou imported. Once notes have been created for an image, whenever that image is used in a BiteFX session recording, those notes will be displayed in the BiteFX Session Report when it is published. 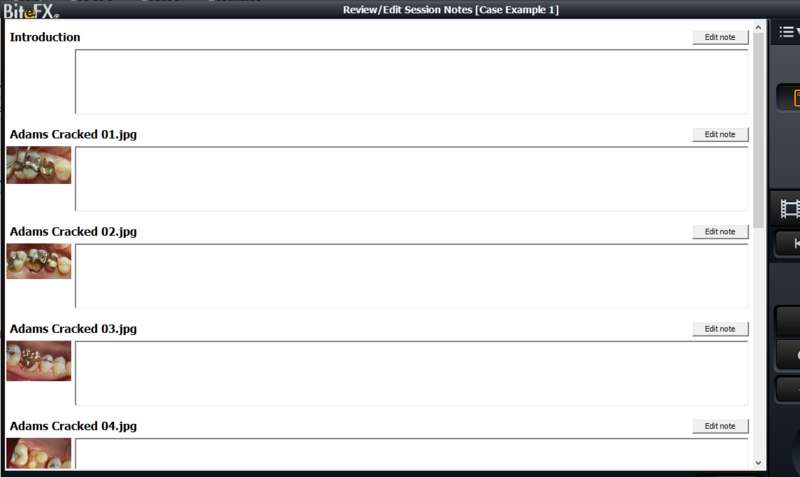 Image notes can be modified anytime by selecting the image, selecting "Edit session notes", deleting the existing notes and replacing them using Method 1 described above. If you have activated Use Information Sharing from the Option> Information Sharing sub-menu, when you add or modify notes for an imported picture on one computer, those notes will automatically be appended to that same picture on every other BiteFX computer where that picture has been imported as well.